Day Five. And I still can't lift my left arm. It's just much too painful! I actually decided late last night that it's time to "bite the bullet" and have a professional look at it. I made the earliest available appointment for Thursday afternoon. The good news? I'm going to the world famous Kerlan/Jobe orthopedic clinic. Dr. Jobe is a legend in Los Angeles! I'm sure I won't get to see him personally....but still...they are supposed to be the best. Ever hear of "Tommy John Surgery"? 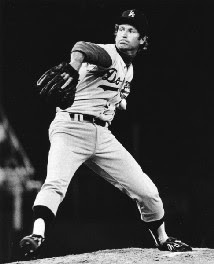 The surgery is named after Tommy John, a pitcher for the Los Angeles Dodgers who was the first professional athlete to successfully undergo the operation in 1974. The procedure was performed by none-other-than Dr. Frank Jobe himself! The actual surgery is an elbow procedure. There are 180 major-and-minor league pitchers who have had the surgery...including Nick Adenhart (RIP) of the Angels who was killed in a traffic accident last year. Why am I even thinking about surgery? Well...I've always been a "glass half empty" kind of person. (Just ask Suzzanne!) I always figure that if I expect the very worst, then when it turns out that the situation is not so dire, I can be pleasantly surprised!! My shoulder actually feels a little better today. Maybe a tiny bit more range of motion. But I feel better just knowing that I'm going to get some answers...or at least I'm going to be on the road to getting some answers...on Thursday afternoon. The timing of this whole thing could not be worse...it's only two weeks until we get on the plane. If you think about it, send up an extra prayer or a "kind thought" on Thursday morning when you say your prayers.